Our ladies and guys stainless steel 6oz hip flasks are designed, printed and hand applied in South Carolina. Flasks are wrapped in high quality long, lasting vinyl and guaranteed to please this holiday season. Perfect for stocking stuffers! Are you a cat lover and love to drink? 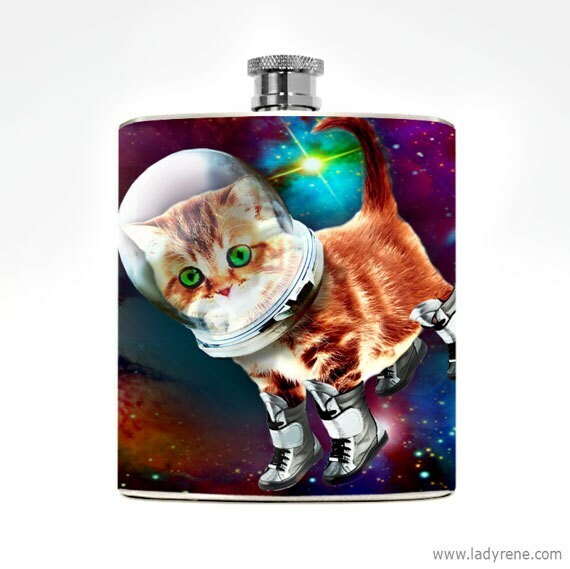 Who doesn't love a galaxy cat flask even if you aren't a cat person (we certainly do). Well, no matter your reason for wanting to buy this "oh so awesome" flask....you won't be disappointed. And, if you're gifting this to your cat lover friend they are sure to love this unique gift. If yes, please type your request with font and placement of your name, initials or short phrase in the 'add your personalization' box. We can place writing most anywhere on the design EXCEPT the backside center. If a font and position for the personalization are not specified by the buyer we will choose the placement for you. Provide current email in case we need to email you a mockup or have questions. LOVE this! Especially the personalization. Shipped quick and perfect! The sellers communication was on point too. She made sure everything was up to par before she sent it-when it was not she fixed it and immediately shipped it out. Items are FINAL SALE, and we will only accept returns on special orders in the event of a mistake on our part or damage to the product. Damaged merchandise may be returned for a replacement. You may be required to return the item or take photos of the damage. In the event that a replacement is not available the purchase price will be refunded. Please send email with your name, order # and a brief description of the damaged item or items being returned. Return shipping is nonrefundable. IMPORTANT:Customs may cause significant delays. Please allow at least 3 or more weeks for your order to arrive depending on destination. Destination Duties, Taxes, & Import Charges are buyers responsibility. Please note: All flasks are made to order. Please allow time for us to process your order. Most orders ship within 3-5 business days. Shipping time is additional. When a package is shipped internationally, it may be subject to import taxes, customs duties, and/or fees imposed by the destination country. These charges will typically be due once the shipped goods arrive at the country of destination. It would be similar to VAT. As per our shop polices, we don't know what those charges may be and can't legally charge for them.